Add water and part of the sugar to a saucepan over medium-low heat. Stir well. Use a candy thermometer to check the temperate and remove from heat once the syrup reaches 120°C/250°F. 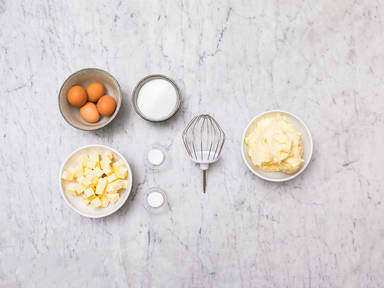 As the sugar syrup heats up, add egg whites to the bowl of a stand mixer and mix on high speed for approx. 1 min. or until foamy. Reduce mixing speed to low and slowly stream in the remaining sugar , vanilla sugar, salt. Then increase the mixing speed to high for approx. 1 min. to combine well. Reduce speed to low and continue to mix for approx. 2 min. more. Slowly stream in the still-hot sugar syrup and increase the mixing speed to medium-high. Continue mixing until the mixture cools down to room temperature, approx. 10 min. Transfer the bowl to the fridge and chill for approx. 30 min. Return the bowl to the stand mixer and turn to medium-low speed. Slowly add the chilled, cubed butter. Increase the mixing speed to high. The mixture will look split but continue mixing until it comes together as a smooth buttercream. This can take between approx. 10 – 40 minutes depending on the temperature. Once done, use immediately or refrigerate in an airtight container. Enjoy!